Christopher can often be found playing football with his friends. He may be small, but he has no fear playing in goal against the older boys. Christopher is half brother to Grace. They share the same father. Christopher's father left their home to find work. Struggling to care for Christopher, his mother brought him to the orphanage. Christopher's mother then told Grace's mother what she had done. The mother was also having a difficult time supporting Grace. Shortly after Christopher and Grace arrived, Patrick found their father. He had moved to Guinea hoping to find work to support his family. Unfortunately when he arrived in Guinea there were no jobs available. Communication home was impossible. 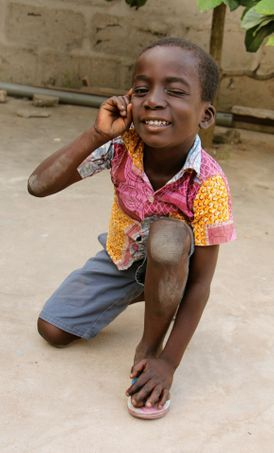 He is trying to get back to Ghana but that is proving to be difficult. He has sent 200 cedi to help the children and promises to send more. He is so grateful for everything Patrick is doing for his children. Both Christopher and Grace have had an opportunity to talk to their father on the phone. Christopher wants to be a pastor when he gets older.